*** gulp, gulp, gulp….ahhhhh*** Imagine sipping an ice-cold craft beer served freshly chilled from a keg. Now imagine doing all of that from your basement any time you want. That’s the reality when you own a kegerator. But last time we bought a new one, we spent more than we wanted and had to replace it faster than you can say Jacobsen Golden Naked Christmas Ale. 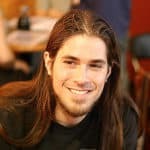 So we created this kegerator reviews guide to help you avoid our problem. We tested the best kegerator models on the market to put this guide together. Use it to make an informed decision and don’t waste money like we did! 2 What is a Kegerator? 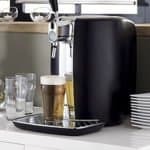 7 What’s The Best Kegerator? Most craft pubs don’t have just one beer on tap. If your goal is to open the next great neighborhood pub (basically, a place for your friends to hang out and watch football), then you might need to take a step up. 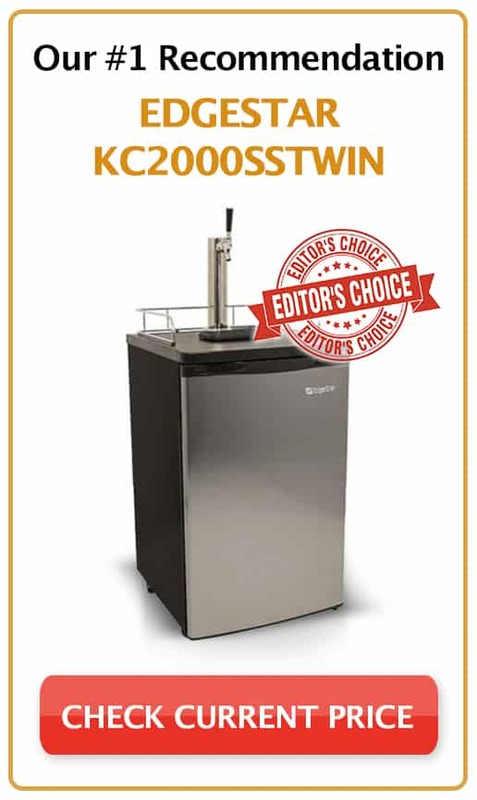 The EdgeStar KC2000SSTWIN has been the easy top choice for beer enthusiasts for years. 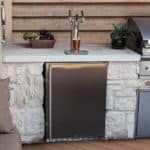 This kegerator with dual taps is the pricier older brother of the single-tap model but comes with most of the same features (besides the obvious one). 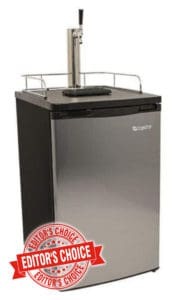 Capable of cooling into the low 30’s and equipped with a sturdy stainless steel frame, you’ll be able to produce ice-cold beer for a long time, whether it’s for bottles or a chilled glass. It fits two 1/6th kegs or two “Cornelius Homebrew Kegs,” each holding about 40 pints. If you want the best bang for the buck, we highly recommend that you get this kergerator and be thrilled by it like the other real beer enthusiasts who bought this product. If you squint really hard, you could mistake this commercial kegerator for a space-age droid. Complete with digital temperature controls, a deep-chill instant cooling mechanism with just a click, and stainless interior ensure that NASA will come calling when it’s time to provide the Mars Mission with some chilly brew. That being said, the price tag on this 2 tap kegerator is a bit on the high side to purchase. You definitely pay for what you get, so it’s definitely one of the best kegerators out there. Another added bonus that customers enjoy is the flexibility of choosing between a full keg or two half kegs. If you’ve got the money to spare and need a more industrial-strength model, then this one is for you. 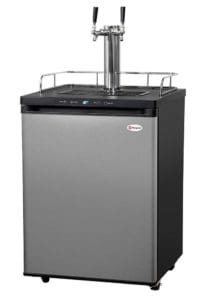 Nestled neatly between the compact mini models and high-end commercial products, the EdgeStar KC2000 kegerator is a decent kergerator . It combines durability and power—so you won’t miss too much of the game—into a compact size. This unit can fit snugly in your home without eating up all of your space (and your bank account). It’s capable of reaching temperatures well in to the low 30s and comes in two sleek colors, black and stainless steel (and single or double tap format). 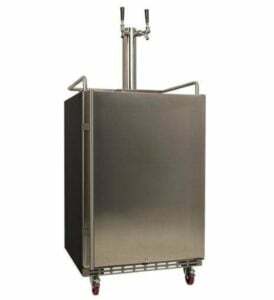 It gives you a bit of added flexibility with ¼ or 1/2-keg sizes. Real beer enthusiasts will love the guardrail that supports glasses and prevents them from falling over (in case you’re the type that enjoys your beer a bit too much!). It doesn’t have all the bells and whistles of a hi-tech commercial kegerator system (such as digital controls), but that’s not what most are after. It may be number three on our list, but Nostalgia is a more bespoke brand with fewer dispenser models than competitors, and reviews were good, so we decided to check them out. If you want a model that lets you pour beer quickly and easily, a Nostalgia kegerator will do just fine. What impressed us most is the spring-loaded tap for a quick, accurate pour. Also, we went a while between usage and it never backed up. Don’t let a thirsty crowd get grumpy by keeping them waiting! Aside from the tap, its exterior is really a throwback to those old-school bars of the 80’s and 90’s. It’s a good fit and doesn’t take up much room if that’s the look you’re going for. 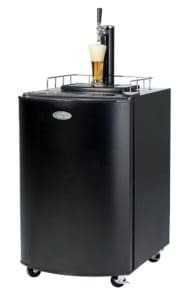 One perk about this kegerator is that it can support anything from a 1/6th to a full ½ barrel of draft beer! 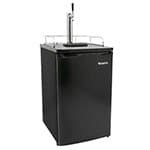 When we tried the Keggermeister kegerator model, we didn’t expect too much since the price point was lower than most. However, we were pleasantly surprised. 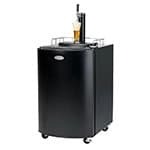 It claims to keep beer fresh up to 3 months, and it can even fit a full-sized keg without taking up much extra space, giving you a decent amount of easy draft beer. We liked the sleek design and the fact that it came with a neat chrome guard rail. But in the end, what stuck out to us was the price. 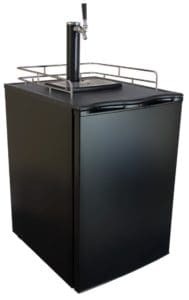 We definitely don’t want to call it a cheap home kegerator, but if you are on a tight budget and need a basic model to keep your beer chilled, there’s nothing wrong with it. Just don’t expect to get too much extra. For some of us, a compact chiller and a mini-keg are all we need to have fun. Some of us, however, think bigger. We’re more ambitious. We’re more fanatical. That’s the advantage of the modern beer-accessory market—anything you want, you can find. But, that’s also a bit of an issue too. The sheer amount of kegerator choices makes it difficult to know where to start. We’ve put together this guide to the different types of beer keg refrigerators so you don’t go home with the wrong one. 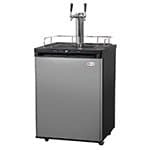 Freestanding kegerators are what started the home kegging revolution. 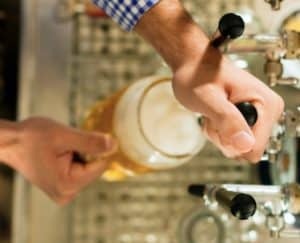 They allow beer enthusiasts across the world to enjoy fresh beer from the keg without needing to make a major investment in chilling infrastructure. They are portable (usually on wheels), self-sustaining (meaning the chilling mechanism is located on the machine rather than externally), and, more importantly, they’re more affordable than other types. Note: All models featured in this guide are freestanding. 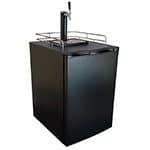 Mini Kegerators (also known as tabletop or countertop) are perfect for a beer enthusiast who only needs a small pour. What you sacrifice in size you make back in price, convenience, and portability. Just pick it up and bring it to your boat (you own a boat, right? ), your friend’s house, or the golf course! There’s a range of famous brands producing 5L kegs that fit right in (Heineken, Newcastle). The more commercial cousin of the freestanding model is the built-in kegerator. These are built in (surprise!) to cabinetry or some similar structure and are usually used in bars. Basically, they are used when the tap is needed on a countertop (like at the local pub). What they lack in portability and affordability they make up for in specialized ventilation. They cost more than freestanding models and require the right infrastructure, but are worth it if you want a classier faucet at home. This is for the big boys. 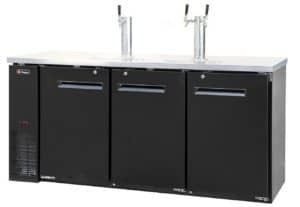 Commercial kegerators usually have a massive capacity (up to 5 full keg barrels), are versatile (they have multiple taps and hold cans and bar accessories), and are extremely durable. Their commercial-grade steel, security measures (locks), and interior lightning equip them to handle even the most raucous Saturday night pubs. Nothing is better than a chilled glass or bottle of beer on your patio served from a chilled keg. 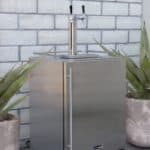 Outdoor kegerators are built for damp environments, so if you have a patio, pergola, terrace, or even just a damp area of your basement, they are the solution. The rust-resistant exteriors and stainless steel components are hurricane-proof, just don’t knock them over after a few too many! Of course, the downside to the extra protection is the increased cost. An undercounter kegerator is basically the same as a built-in one except it’s usually more mobile. They are perfect for home bars and will fit snugly under your kitchen counter. Some models come with wheels, but most are made to fit under a bar and have the tap pour over a counter. We won’t go into too much detail since they are basically the same as built-in kegerators. You’ve just spent the night savoring delicious kegged beer at a friends house, and now you’re envious of his killer set up. It’s time to get your own, but you don’t even know where to start. Sound familiar? Most first-time buyers don’t know what to consider when buying a beer kegerator, so we’ve put together a few guidelines for you to read. Size: Kegerators come in all shapes and sizes—from minis to commercial behemoths that span the horizon. Most normal models are around 15-24 inches in diameter. Consider your size constraints—is it going under a home bar? Do you want it on your table top? 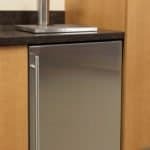 Maintenance: Kegerators don’t come cheap, so you’ll want to consider durability and maintenance. The more upkeep, the more headaches for you. More advanced models normally require extra cleaning or some tune-ups now and then. It’s worth it for the quality, in our opinion. Consumption: Are you a casual beer drinker? Or are you a rabid fanatic? Consider consumption levels before buying. If you just want to enjoy a beer after work from time to time, a mini will do. If you plan to have guests over and indulge, you may need 5 gallons or more. You don’t want to have to store too many kegs. Portability: It goes without saying that a larger model won’t be very portable. Thankfully, standalone models typically come with wheels and are small enough to be moved about. Just know that if you get a built-in model, it won’t be going anywhere anytime soon. 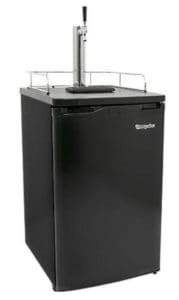 Beer tower cooler (kegerator tower cooler): You know what’s better than an ice cold beer? An even icier, colder beer without foam. If you’re tired of foamy beer that warms up on the way from the keg to your mug, a beer tower cooler will put an end to that instantly. Tap handles: It’s time to add a hint of personalization to your tap. Pouring from a handle is nice, but pouring by pulling a guitar, supermodel, or branded handle is even better. The tap handle fits right over your tap and lets you pour beer in style. Faucets: High-quality faucets will keep your beer safe from mold and bacteria, and they’ll do it in style. Choose from chrome or stainless steel and start pouring with a sense of class! Cleaning Kit: Over time, mold, bacteria, beer stone and other impurities will build up inside your kegerator. A cleaning kit will make cleaning a breeze. Kegerator Skins: These are our favorite accessories. A kegerator skin is the awesome Halloween costume that your beer kegerator gets to wear all year round. Now you can fully show off your personality to everyone. Drip trays: A drip tray will keep your bar, countertop, and kegerator clean and safe from any liquid that drips from the tap. Tap soother: Also known as “caps”, these fit snugly over the tap when not in use to protect you from evil fruit flies and nasty bacteria. They’re a must for outdoor kegerators. CO2 Regulator: This device allows you to control the flow of CO2. If your pounds per square inch are too high, it’s not only dangerous to work with, it makes pouring beer difficult too (which is way more important). CO2 Tank: Pretty self-explanatory here. A CO2 tank stores (you guessed it) CO2! Beer Keg: If you’re brewing delicious craft homebrew, you might want to chill it in a keg. Why bother buying kegs from the store when you can make your own beer? Chilling in a keg is easier and can even produce higher quality beer. It’s possible to convert your fridge into a kegerator. All you need is a conversion kit. With a kit, you can convert any old fridge into an awesome keg chiller. Just imagine being able to walk by your fridge, pull a tap planted on the front, and pour a delicious beer while getting food for your next meal. Sounds like a dream come true. Basically, you just put the keg inside, set up a mechanism for getting the beer out, and install the handle. Want to learn how to build a DIY kegerator? We put together a complete guide to doing it here. 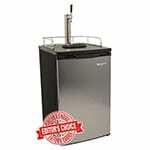 All of these models are great, but if we had to choose one as the best kegerator, it would be the EdgeStar KC2000SSTwin. The quality is amazing and even though it’s quite pricey, you will get the best quality any kergerators can provide. 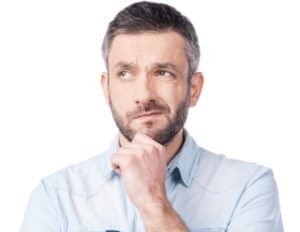 Buying cheap products often leads to dissatisfaction and we guarantee you that investing in this product is worth every buck. The best part is how it chills beer down to arctic temperatures for an ice-cold pour. If you’re just buying one for the first time, this is definitely the perfect model to start with. The investment is guaranteed to last and the quality is high. Can’t beat that!